Annabelle: Creation is a 2017 American supernatural horror film directed by David F. Sandberg, written by Gary Dauberman and produced by Peter Safran and James Wan. It is a prequel to 2014's Annabelle, the second installment in the Annabelle series, and the fourth installment in the Conjuring Universe franchise. The film stars Stephanie Sigman, Talitha Bateman, Anthony LaPaglia, and Miranda Otto, and depicts the possessed Annabelle doll's origin. Annabelle: Creation premiered at the LA Film Festival on June 19, 2017, and was theatrically released in the United States on August 11, 2017. The film grossed over $306 million worldwide and received generally positive reviews from critics, who praised the atmosphere and acting, and noted it as an improvement over its predecessor. A sequel, Annabelle Comes Home, is scheduled to be released on June 28, 2019. In 1943, dollmaker Samuel Mullins and his wife Esther grieve for the loss of their seven-year-old daughter Annabelle "Bee", who is killed when she accidentally steps in front of a car. Twelve years later, in 1955, the Mullins open their home to provide shelter for Sister Charlotte and six girls left homeless by the closing of their orphanage. Despite having been told not to enter Bee's locked bedroom, Janice, a young orphan handicapped by polio, discovers a note saying "Find me" and sneaks into the room, which has mysteriously become unlocked. She finds a key for Bee's closet and opens it, where she sees an eerie porcelain doll. This unwittingly releases a powerful demon that begins to terrorize the girls. On the second night, the demon, taking Bee's form, appears to Janice, saying that it wants her soul. Although she attempts to get away using a stairlift, the demon catches up to her and throws her from the stairlift, leaving her severely injured and confined to a wheelchair. Janice's best friend Linda is tormented by the demon. The next morning, the demon, posing as the demon nun Valak, attacks Janice and possesses her. Linda notices changes in Janice's behavior and tells Samuel that Janice snuck into Bee's room and found the doll. Janice, who can now walk, transforms into the demon and brutally kills Samuel. Linda takes Janice's doll and throws it into the well. A strange noise comes from the well and she is almost dragged into it, but Sister Charlotte saves her. Alarmed, Sister Charlotte speaks with the disfigured Esther, who is confined to her bedroom. Esther explains that after Bee's death, they prayed to whatever entity would grant their wish to see their daughter again. An unknown entity answered their prayer and though they briefly saw Bee's spirit, the entity convinced them to transfer its essence into one of Samuel's crafted dolls. They happily agreed but soon realized they had attracted a demon looking for a human host. One night, Esther saw Bee's spirit transforming into the demon, which then gouged out her eye. Enlisting the help of priests to bless the house, they locked the doll in Bee's closet. Esther and Samuel opened their house as a shelter to repent for their actions, but Esther now regrets it since this has provided an opportunity for the demon to look for a human host. The demon murders Esther and attacks Sister Charlotte. The orphans leave the house, but Linda is trapped and hides in Bee's room as the possessed Janice tries to stab her. Sister Charlotte locks Janice and the doll inside the closet. The next day, police arrive to search the house and find only the doll, which they remove as evidence. Sister Charlotte, Linda, and the orphans are escorted away by officers, while Janice escapes through a hole in the closet wall and relocates to an orphanage in Santa Monica. Still possessed, she becomes reclusive and calls herself Annabelle. The Higgins family soon adopt Annabelle. Additionally, Annabelle Wallis and Ward Horton appear in archive footage from Annabelle as Mia and John Form, respectively, and Bonnie Aarons reprises her role from The Conjuring 2 as the demon nun Valak in an uncredited appearance. In October 2015, it was confirmed that an Annabelle sequel was in development. David F. Sandberg replaced Annabelle's John R. Leonetti as the sequel's director in March 2016. He has described himself as a fan of the franchise, especially the first one, since they were "more of a classic, old-school horror movie in many ways." James Wan and New Line Cinema approached Sandberg to helm the sequel during the post-production on Lights Out, after they were impressed by the early cuts of the film. Sandberg and Wan had met each other during production of Lights Out, as the movie was produced by Wan's Atomic Monster Productions. Sandberg did not want to direct another formulaic horror sequel, but after reading the script and realising how it deviated from the first film, he agreed to direct it. He was attracted to it as it was a standalone film, as a result of which he had more creative freedom. The fact that it was a period piece made it more appealing to him. The first film's screenwriter, Gary Dauberman, returned to write the script, with Peter Safran and James Wan returning to produce. In March 2017, Sandberg revealed the film would be a prequel to the original Annabelle film, and titled Annabelle: Creation. Sandberg drew references from the look of the 1963 psychological horror film The Haunting, due to its use of CinemaScope cinematography, and cited the score of The Shining to be the biggest inspiration for the film's chilling music. He also borrowed inspiration from the "old school" feel of The Conjuring. He decided he would rely upon tension and suspense, as opposed to jump scares. Unlike his debut film Lights Out, in which he meticulously crafted each scene beforehand, Sandberg had a different approach to Annabelle: Creation. With Annabelle he "was inspired by the set and moment" and so did not prepare with extensive storyboards or diagrams, instead relying on the mantra, "We'll figure it out on set together. We'll make it work." Sandberg softened some of Annabelle's features to make her more believable as a child's toy, having the cheeks filled-out and fixing her overbite. He found shooting with the doll challenging since the object was immobile, and he needed to use other objects – such as a sheet – to make her move around. Father Robert was a consultant on the film. In June 2016, Talitha Bateman, Miranda Otto, and Stephanie Sigman were cast to star in the film. Bateman and fellow child actresses Lulu Wilson and Samara Lee had all seen The Exorcist, and Samara was named after Samara Morgan from The Ring, so despite working on a horror movie, none of the young actresses were disturbed by the film's subject, although some of them did state that they were unsettled by the doll. They said that they did not feel tension or fear throughout production, and Sandberg remarked that the only challenge in working with them was restrictions in terms of hours on the set – such as they cannot work after midnight and work overtime – since they were under age. Bateman was one of the actresses that James Wan had considered for the role of Janet in The Conjuring 2. However, the part eventually went to Madison Wolfe. Since the script demanded a group of children, they brought Bateman in to audition, having been impressed by her screen tests previously. Her brother, Gabriel Bateman, starred in Sandberg's Lights Out. Wilson auditioned for the role of Linda because she wanted to play a horror protagonist, having played an antagonist in Ouija: Origin of Evil. Creation marks her third time starring in a horror film, following Deliver Us from Evil and Ouija. Anthony LaPaglia agreed to star in the film after his 14-year-old daughter overheard him talking on the phone about the movie, and responded enthusiastically to her father taking the role. He has described his character as "a mysterious, quiet-yet-gruff man who is mourning both the loss of his daughter and the medical degeneration of his wife. The young orphans who move into the now-dilapidated house fear him." To get into character, he did not mingle with the young actresses very much on set. He would intentionally distance himself from them so that during filming they would naturally not like him very much. Principal photography began on June 27, 2016, in Los Angeles, California, at the Warner Bros. Studios, Burbank lot, and concluded on August 15, 2016. The film received California film and television tax credits in the amount of $2.4 million after spending $17.4 million in the state. Sandberg decided to use Steadicam and tracking shots, because of the film's period setting, and he wanted to maintain the "old school" feel of the first two The Conjuring films. According to Sandberg, he does not believe in ghosts or demonic entities, saying, "I haven't experienced anything in life that would lead me to believe they exist". Sandberg reported that actress Stephanie Sigman, who played Sister Charlotte, was "a little bit freaked out by that doll" and, after hearing that a priest had blessed the set of The Conjuring 2, requested the same ritual be performed for this film. In July 2017, Warner Bros. Pictures, in conjunction with James Wan, announced the "My Annabelle Creation" competition as promotion for the then-upcoming film Annabelle: Creation. 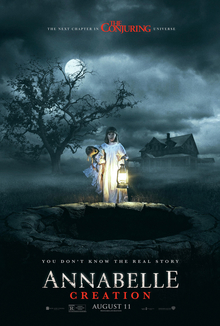 Participants of the competition were to shoot a short film which would "feel like (it) could exist within the established Conjuring world", with the winning films' directors winning a trip to Los Angeles to meet with David F. Sandberg, the director of Annabelle: Creation, and a New Line Cinema's executive. The entry deadline was July 27, 2017, with five separate competition winners being selected from the United States, the United Kingdom, Mexico, Sweden and Colombia. The winner from the United States competition was Julian Terry for his short film The Nurse. Just under 2 minutes in length and filmed over four days, the film revolves around a bandaged and temporarily blind girl named Emily (Aria Walters) who attempts to elude the eponymous Demon Nurse (Hannah Palazzi). The winner from the United Kingdom competition was Liam Banks for his short film The Confession. Just over 2 minutes in length and filmed over one week, the film revolves around a psychologically-damaged young woman (Esmee Matthews) confiding in a priest (Charlie Clarke) regarding her terrifying encounters with supernatural entities, only to realize she never escaped. The winner from the Mexico competition was Raùl Bribiesca for his short film What's Wrong With Mom?. Exactly 2 minutes in length and filmed in a single take, the film revolves around a father (Fabián Hurtado) and daughter (Carina Pámenes) as they're praying to God to exorcise the mother (Perla Corona) of the "Marifer", a teleporting demon possessing her. The winner from the Sweden competition was Amanda Nilsson and Magda Lindblom for their short film Blund's Lullaby. Just over 2 minutes in length, the film was inspired by the nordic version of the Sandman, known as John Blund. The winner from the Colombia competition was Alejandro López for his short film Almas Inocentes (English: Innocent Souls). On November 23, 2016, Benjamin Wallfisch was hired to compose the music for the film. WaterTower Music released the soundtrack album on August 4, 2017. The film was originally set for release on May 19, 2017. But was pushed back from its original release date of May 19, 2017 to August 11, 2017, to avoid competition with Alien: Covenant. The film premiered at the Los Angeles Film Festival on June 19, 2017. The film was released on Digital HD on October 17, 2017, and on Blu-ray and DVD on October 24, 2017. Annabelle: Creation grossed $102.1 million in the United States and Canada and $204.4 million in other territories, for a worldwide total of $306.5 million, against a production budget of $15 million. With its release, it pushed The Conjuring franchise past the $1 billion threshold, making it only the third horror series to cross that mark, after the Alien franchise and Resident Evil series. Deadline Hollywood calculated the film made a net profit of $108.7 million, when factoring together all expenses and revenues. In North America, the film was released alongside The Nut Job 2: Nutty by Nature and The Glass Castle, and was projected to gross around $30 million from 3,502 theaters in its opening weekend. The film grossed $4 million from its Thursday night previews, the highest of The Conjuring series and double the original Annabelle's $2.1 million. It went on to open to $35 million, the lowest of the series, but still topping the box office. In its second weekend, the film dropped 55.7% to earn another $15.5 million, which was a smaller second-weekend drop than Annabelle (57%) and The Conjuring 2 (63%), and the best second-weekend hold of the franchise since the initial Conjuring film (46%). Outside North America, the film was released to positive reception from international audiences, which is reflected in its box office performance. It broke several opening records for the horror genre as well as for the studio and came in ahead of The Conjuring and Annabelle in many markets. The week prior to its domestic release, the film debuted in Italy at number one, with $1.1 million. It earned $35.4 million on its opening weekend from 39 markets, almost on par with its domestic debut and marking the second biggest international opening in the franchise, behind only The Conjuring 2. Overall, the film was number two at the international box office after Wolf Warrior 2. The film expanded to 56 markets in its sophomore weekend, adding a handful of major markets and thereby topping the worldwide chart for the first time with an estimated $42 million. It recorded the highest opening weekend in the franchise in 26 markets and the biggest launch for a horror film of all time in Sweden, Poland, Portugal, India, Malaysia ($2.2 million), the UAE ($1.1 million) and Vietnam. The top openings came from Mexico ($8 million), Korea ($6.7 million), and India ($9.8 million). In South Korea, the film grossed $1.2 million from Thursday previews. Despite its South Korean release falling during diplomatic tensions, it ultimately opened there with $6.7 million, as the number one foreign release and the third highest-grossing movie overall behind local films A Taxi Driver and Midnight Runners. On review aggregator website Rotten Tomatoes, the film has an approval rating of 70% based on 175 reviews, with an average rating of 6.18/10. The website's critical consensus reads, "Annabelle: Creation adds another strong chapter to the Conjuring franchise–and offers further proof that freaky-looking dolls remain reliably terrifying." Metacritic, another review aggregator, assigned the film a weighted average score of 62 out of 100, based on 29 critics, indicating "generally favorable reviews". Audiences polled by CinemaScore gave the film an average grade of "B" on an A+ to F scale, the same score earned by the first Annabelle film. Justin Lowe of The Hollywood Reporter called it "wickedly terrifying," and said it was "closer in tone and old-school psychological fright tactics to the original film than either The Conjuring 2 or Annabelle." Peter Debruge of Variety, while criticising the plot, said the film nevertheless "manages to conjure some effective scares," and that "this effective yet empty-headed horror movie goes to show how eager audiences are to be scared, and how even an unsightly doll can do the trick when the spirit is willing." Similarly, Chris Hewitt of Empire felt that while the "movie can't hold a flickering candle to the James Wan-directed entries in the series... it's got plenty of decent shocks, and the odd genuine surprise, up its sleeve." However, Emily Yoshida of Vulture wrote that "Annabelle: Creation's countless sequences of foreboding silence—hands reaching for doorknobs, our heroines shuddering in the dark, waiting for their demonic tormentor to attack—offer nothing to really latch on to, no larger reason to care that's not purely technical". Chris Nashawaty of Entertainment Weekly gave the film a "C" grade, calling it "a mishmash of clichés and nonsense" and writing that "none of this will seem new to horror fans". In April 2018, Warner Bros. announced July 3, 2019, as the release date for an as-yet untitled new film in The Conjuring franchise. Later that month it was announced that the film will be a third Annabelle film, with Gary Dauberman signed on to write and direct, in his directorial debut. James Wan and Peter Safran will co-produce the project. On February 21, 2019, the film was pushed up five days to June 28. ^ This scene is the opening scene of Annabelle. ^ "Annabelle: Creation (2017)". British Board of Film Classification. Retrieved June 10, 2017. ^ a b c "Annabelle: Creation (2017)". Box Office Mojo. Retrieved September 22, 2017. ^ Foutch, Haleigh (March 31, 2017). "Annabelle 2 – Trailer Teaser". Collider.com. ^ Giles, Jeff (August 10, 2017). "Annabelle: Creation is a Potent Prequel". Rotten Tomatoes. Retrieved August 11, 2017. ^ Leadbeater, Alex (August 11, 2017). "Annabelle: Creation Ending & Post-Credits Scenes Explained". Screen Rant. Retrieved September 3, 2018. ^ Fletcher, Rosie; Armitage, Hugh (August 30, 2018). "The Conjuring Universe explained – The Conjuring 3, Annabelle, The Nun, The Crooked Man and more". Digital Spy. Retrieved September 3, 2018. ^ a b c d e f g Taylor, Drew (August 8, 2017). "David Sandberg on the Horror Inspiration Behind 'Annabelle: Creation'". Moviefone. Retrieved August 8, 2017. ^ a b Collins, Clark (August 7, 2017). "James Wan gives update on The Conjuring 3". Entertainment Weekly. Retrieved August 8, 2017. ^ Casillas, Matt (August 7, 2017). "David F. Sandberg on 'Annabelle: Creation:' 'It really felt like something I could make my own'". Silver Screen Beat. Retrieved August 8, 2017. ^ "'Annabelle 2' Director Reveals Horror Sequel's Title". The Hollywood Reporter. March 29, 2017. Retrieved March 30, 2017. ^ a b c Daswani, Kavita. "Annabelle: Creation director David F. Sandberg's horror inspirations and how he brings fresh twists to the genre". South China Morning Post. Retrieved August 7, 2017. ^ a b c Banks, Nick (August 7, 2017). "'Annabelle: Creation' Director David F. Sandberg: The Horror News Network Interview". Horror News Network. Retrieved August 8, 2017. ^ Alexander, Bryan (August 8, 2017). "'Annabelle: Creation': The 'true' story of the evil doll star". USA Today. Retrieved August 8, 2017. ^ Weber, Rachel (August 10, 2017). "Annabelle: Creation makers hired an actual exorcism expert". Retrieved August 11, 2017. ^ Kroll, Justin (June 22, 2016). "'Spectre' Actress Stephanie Sigman to Star in 'Annabelle' Sequel (EXCLUSIVE)". Variety. Retrieved June 22, 2016. ^ Lincoln, Ross A. (June 24, 2016). "Maggie Grace Joins Comedy Heist Pic 'Supercon'; Talitha Bateman Joins 'Annabelle 2'". Deadline Hollywood. Retrieved June 28, 2016. ^ Wilson, Staci Layne (August 7, 2017). "Annabelle: Creation – Exclusive Interview with Lulu Wilson". Dread Central. Retrieved August 8, 2017. ^ Pearlman, Cindy (August 6, 2017). "Anthony LaPaglia coaxed into taking horror role in 'Creation'". The Columbus Dispatch. Retrieved August 7, 2017. ^ Mitchell, Peter (August 8, 2017). "LaPaglia, Otto scare in new Annabelle film". The Australian. Retrieved August 8, 2017. ^ Miska, Brad (June 30, 2016). "Even More Dolls On the Set of 'Annabelle 2'". Bloody Disgusting. Retrieved June 30, 2016. ^ Hamman, Cody (June 30, 2016). "The Annabelle 2 Cast Expands as Filming Begins". Joblo. Retrieved June 30, 2016. ^ Sandberg, David F. [@ponysmasher] (August 15, 2016). "That's a wrap on Annabelle 2! Thank you to the awesome cast and crew! In theaters May 2017" (Tweet). Retrieved August 16, 2016 – via Twitter. ^ "2017 Feature Film Study" (PDF). FilmL.A. Feature Film Study. August 2018. ^ Daniell, Mark (August 6, 2017). "'Annabelle: Creation' director David F. Sandberg recounts his Hollywood horror story". Toronto Sun. Retrieved August 7, 2017. ^ a b c Kennedy, Michael (August 17, 2017). "Watch The Conjuring Short Film 'The Nurse'". Screen Rant. ^ "My Annabelle Creation Film Contest". MyAnnabelleCreation.com (Press release). ^ F. Sandberg, David (August 17, 2017). "Check out the US winner of the My Annabelle Creation Short Competition! Stay tuned for winners from MX, CO, UK & SE!". Twitter. Retrieved September 28, 2018. ^ "#MyAnnabelleCreation UK WINNER - The Confession Horror Short Film". YouTube. Retrieved September 10, 2018. ^ "What's wrong with mom? / Award Winner / Horror Short Film". YouTube. Retrieved September 10, 2018. ^ "Blund's Lullaby". YouTube. Retrieved September 14, 2017. ^ "Mi Annabelle Creation. Colombia. Corto: Almas Inocentes". YouTube. Retrieved November 3, 2017. ^ "Benjamin Wallfisch To Score 'Annabelle 2'". Film Music Reporter. November 23, 2016. Retrieved August 2, 2017. ^ "'Annabelle: Creation' Soundtrack Details". Film Music Reporter. August 2, 2017. Retrieved August 13, 2017. ^ McNary, Dave (March 22, 2016). "Ben Affleck's Crime Drama 'Live by Night,' 3 More Warner Bros. Films Dated for 2017". Variety. ^ D'Alessandro, Anthony (December 6, 2016). "Warner Bros. Makes 2017 Schedule Changes To 'King Arthur', 'CHiPS', 'Annabelle 2' & More". Deadline Hollywood. Retrieved December 6, 2016. ^ "Annabelle: Creation DVD Release Date October 24, 2017". DVDs Release Dates. ^ a b Mendelson, Scott (August 20, 2017). "Box Office: 'Annabelle: Creation' Dips Just 56% For $15.5M Weekend". Forbes. Retrieved August 21, 2017. ^ D'Alessandro, Anthony (August 9, 2017). "'Annabelle: Creation' Will Be This Summer's Last Scream At The B.O. With Estimated $30M+ Opening – Preview". Deadline Hollywood. ^ Lang, Brent (August 11, 2017). "Box Office: 'Annabelle: Creation' Nabs $4 million on Thursday Night". Variety. ^ a b D'Alessandro, Anthony (August 13, 2017). "New Line's Dollhouse Of Dough: 'Annabelle: Creation' Opening To $35M". Deadline Hollywood. ^ D'Alessandro, Anthony. "'Hitman's Bodyguard' Flexes Muscle With $21M+ Opening During Sleepy Summer Weekend". Deadline Hollywood. Retrieved August 20, 2017. ^ Tartaglione, Nancy. "China 'Wolf' Howls At $470M; 'Apes' Swings To $148M Offshore; 'Dunkirk' Channels $314M WW – International Box Office". Deadline Hollywood. Retrieved August 7, 2017. ^ a b c d Tartaglione, Nancy (August 15, 2017). "'Wolf' Whistles To $685M; 'Annabelle' Conjures $35M+; 'Spider-Man' Leaps Past $700M WW – International Box Office". Deadline Hollywood. Retrieved August 21, 2017. ^ a b Busch, Anita (August 21, 2017). "Universal $3B+ As 'Despicable' Franchise Takes Ani Crown; 'Wolf Warrior 2' Bests 'Avatar' Record – International Box Office". Deadline Hollywood. Retrieved August 21, 2017. ^ Kelley, Seth (August 21, 2017). "'Annabelle: Creation' Usurps China's 'Wolf Warriors II' at International Box Office". Variety. Retrieved August 21, 2017. ^ Ford, Rebecca; McClintock, Pamela (August 12, 2017). "Weekend Box Office: 'Annabelle: Creation' Terrifying Competition With $36M-Plus Debut". The Hollywood Reporter. ^ "Annabelle: Creation (2017)". Rotten Tomatoes. Fandango Media. Retrieved September 19, 2018. ^ "Annabelle: Creation reviews". Metacritic. Retrieved August 15, 2017. ^ Lowe, Justin (June 20, 2017). "'Annabelle: Creation': Film Review". The Hollywood Reporter. Retrieved August 4, 2017. ^ Debruge, Peter (June 20, 2017). "Film Review: 'Annabelle: Creation'". Variety. Retrieved August 4, 2017. ^ Hewitt, Chris (August 8, 2017). "Annabelle: Creation Review". Empire. Retrieved August 8, 2017. ^ Yoshida, Emily (August 11, 2017). "Annabelle: Creation Proves That Slower Isn't Always Better in Horror". Vulture. Retrieved September 13, 2017. ^ Nashawaty, Chris (August 11, 2017). "Annabelle: Creation is a mishmash of clichés and nonsense: EW review". Entertainment Weekly. Retrieved September 13, 2017.